Post-Pilgrimage reflections and sermon regarding Hope, Peace and Direction. Delivered by Fr. 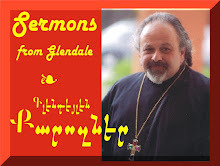 Vazken Movsesian at the St. Peter Armenian Church Youth Ministry Center, Glendale, California on July 20, 2014.